THIS PROJECT IS UNDER CONSTRUCTION, CLICK HERE TO VIEW DAYS 15-17 IMAGES. 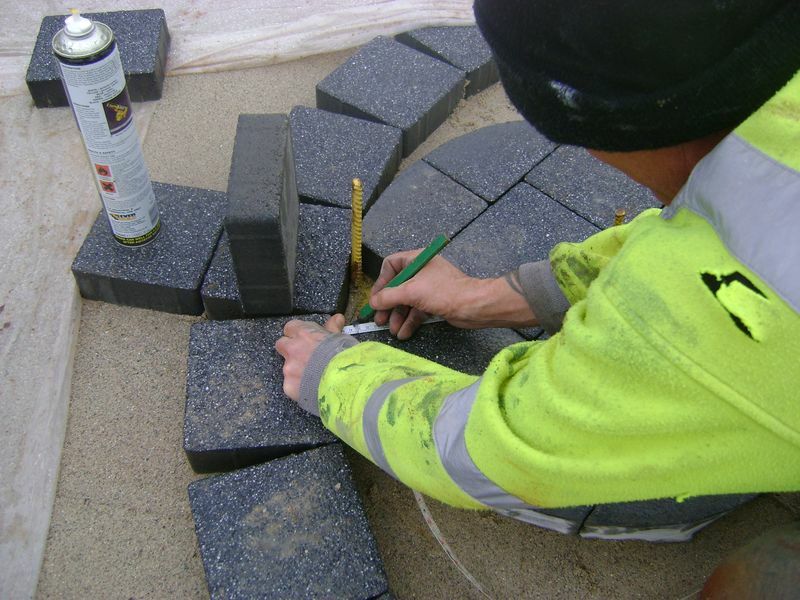 The preparation to install the block paving to the higher seating level commences, four road pins are inserted to the four corners of the project and a taught string line is attached to the correct falls and levels, insulating tape marks the string line. 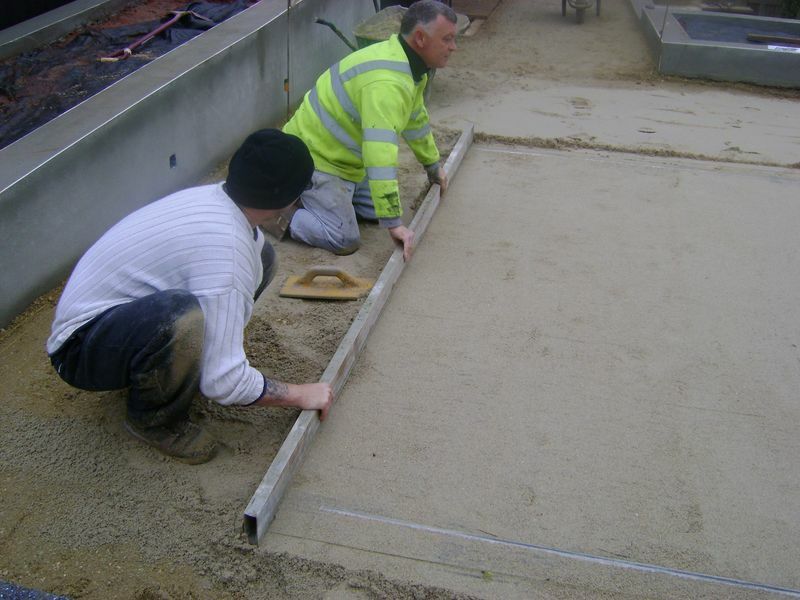 Sand is barrowed to the block paved area and raked to the desired level, a further two pins are inserted and a string line is tied to the level of the perimeter lines, a screed rail is inserted into the sand channel and back filled with sand, using a single block paving unit the rail is lifted to the line to ensure the base of the block is flush with the rail and the finish surface of the block is flush with the line. 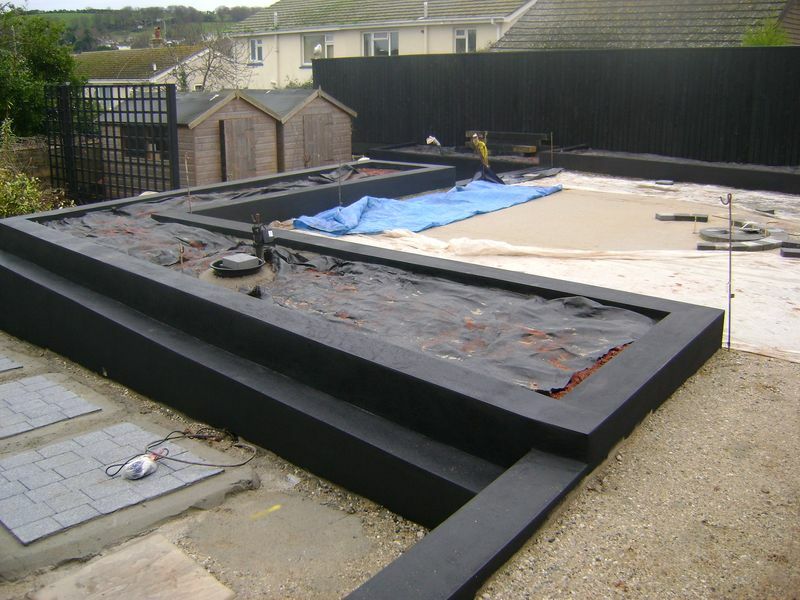 This procedure must be under taken to the entire length of the screed rails. 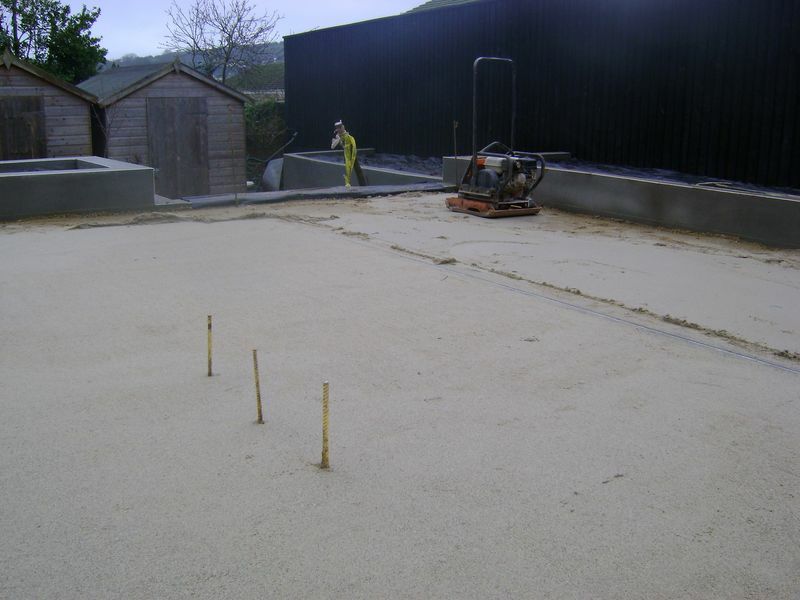 The sand is now consolidated with a compactor and three passes ensure compression. 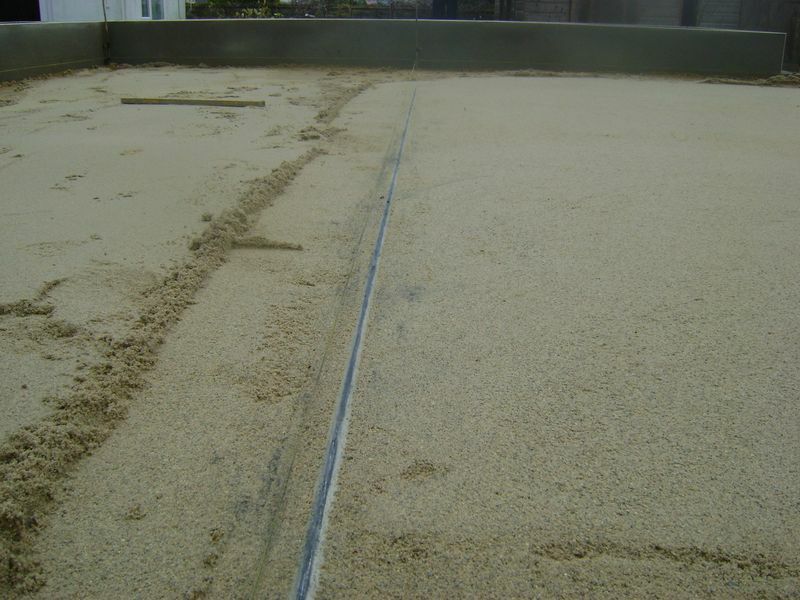 The aluminium screed bar is placed on the rails with a person at each end and pulled over the rails until all the excess sand is removed, place all excess in a barrow and remove from the bar. 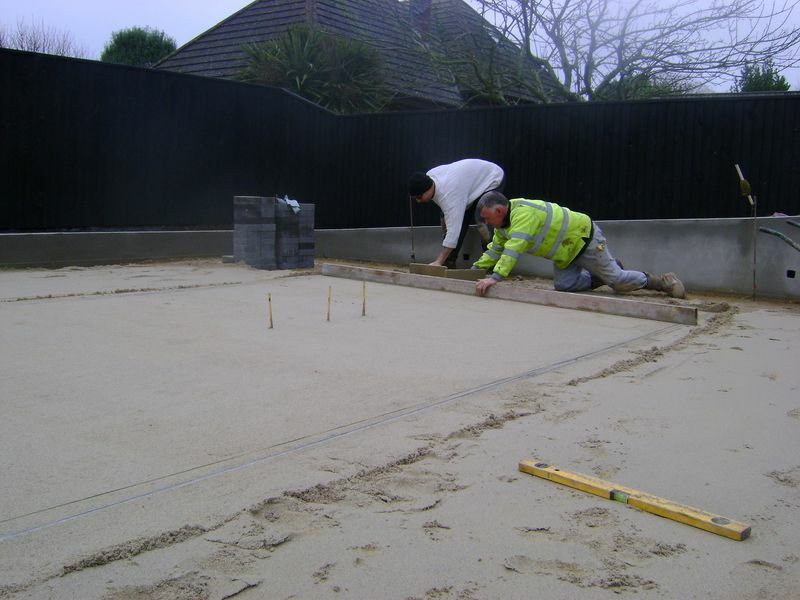 The sand is now level and falling to remove the surface water without puddles or dips once the block paving is installed. 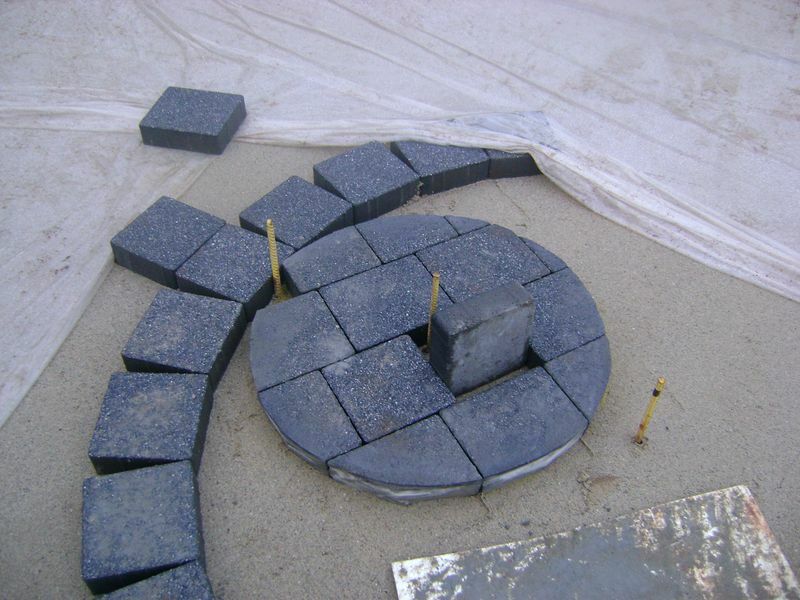 Its imperative that the three pins remain in place as the whole design relies on the correct radius markings from these pins. 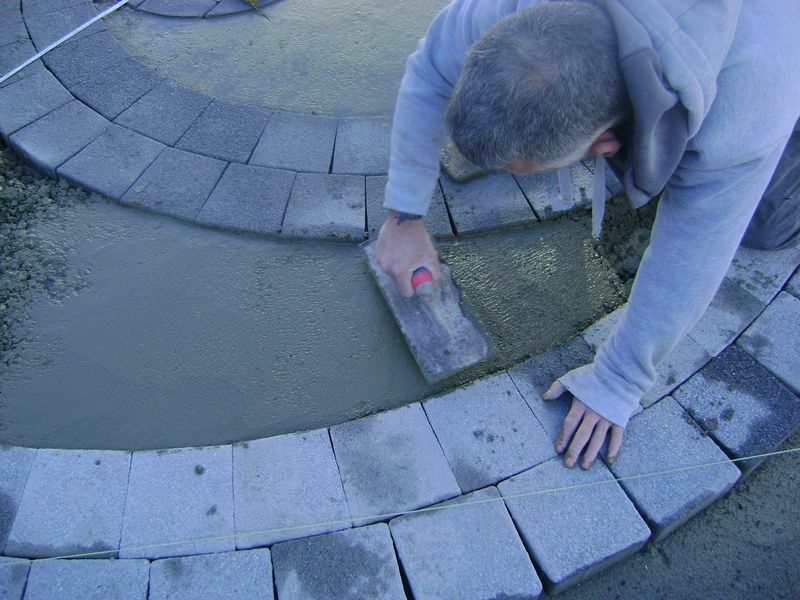 The start of the paving installation, I must make it clear at this stage that on no terms will the paving above be installed and passed over to any client with large gaps between each unit, this is temporary so the inner circle can be marked out and cut. 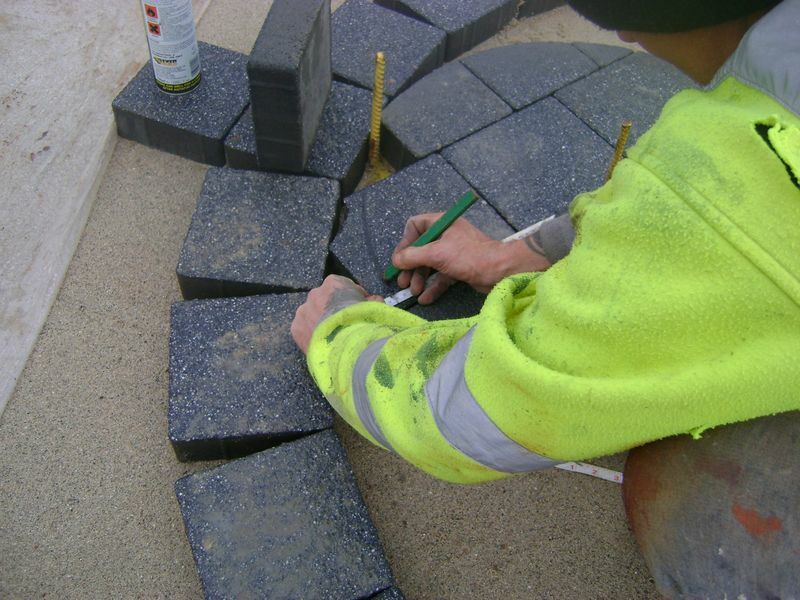 To reduce the gaps in the paving a 110v Clipper cutter on a stand is hired for £40.00 per week, this guarantees that all cuts are tight and clean. To mark the inner circle a 30M tape is hooked over the correct center pin and pulled tight. For this particular circle the diameter is 370mm. 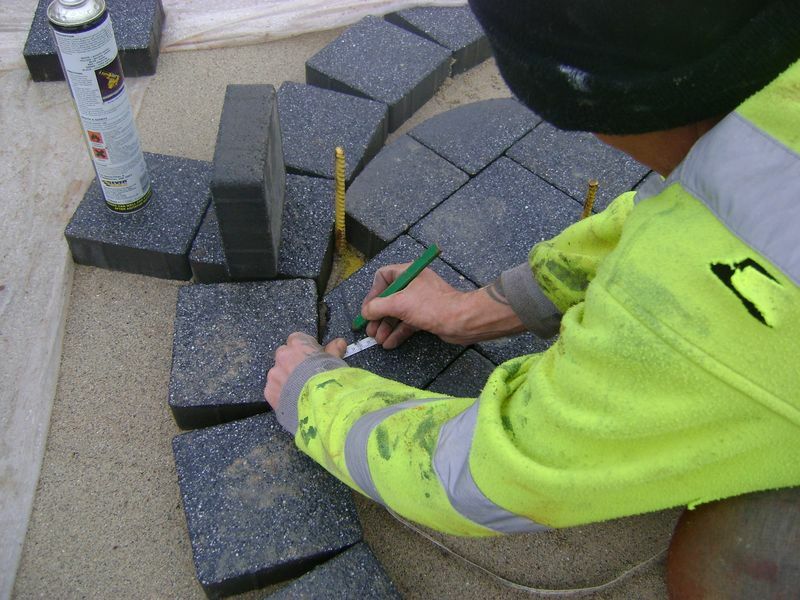 Keeping the 30m Tape tight follow the radius at 370mm and mark the units with a pencil or paviour marker. Take your time and keep the tape tight….. 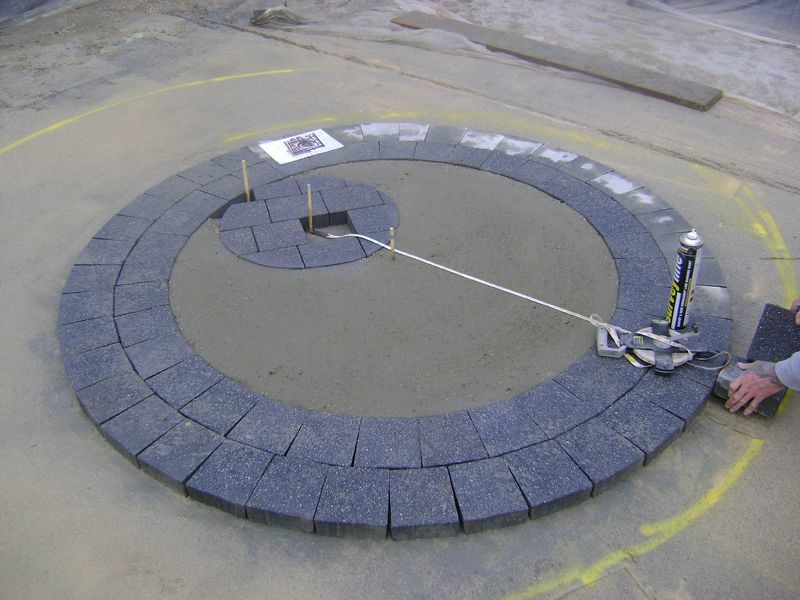 The unit is maked correctly and ready for a Sthil diamond blade disc cutter. 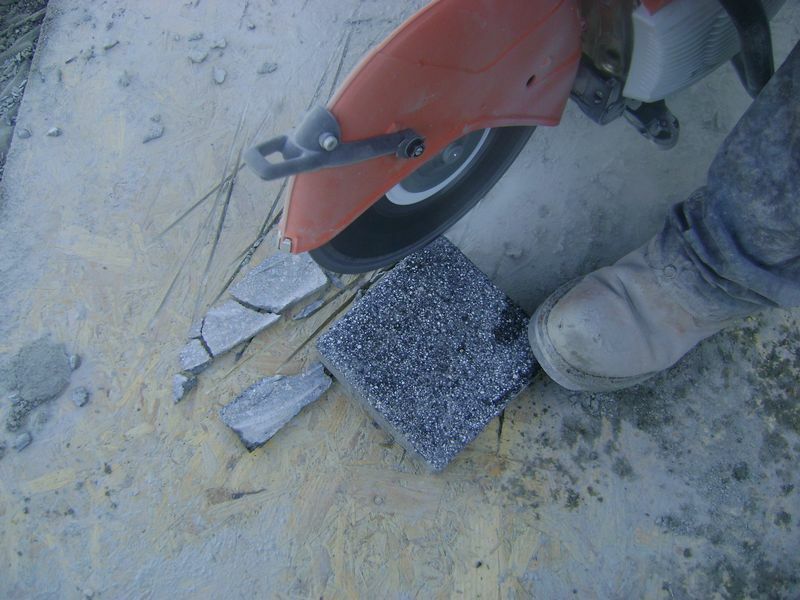 Once cut using the Sthil saw and wearing full all PPE, the unit is installed. 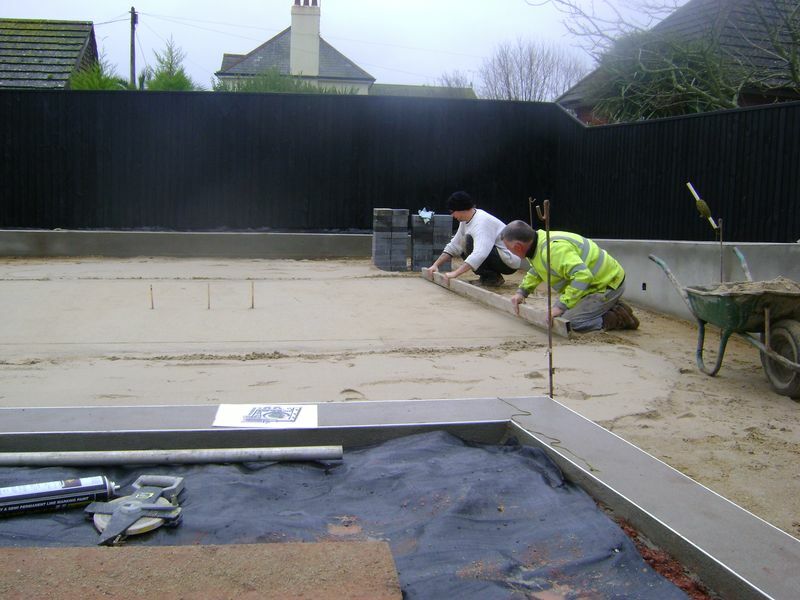 Light weight polythene is used to cover the screed-ed sand as the rain falls on us yet again. 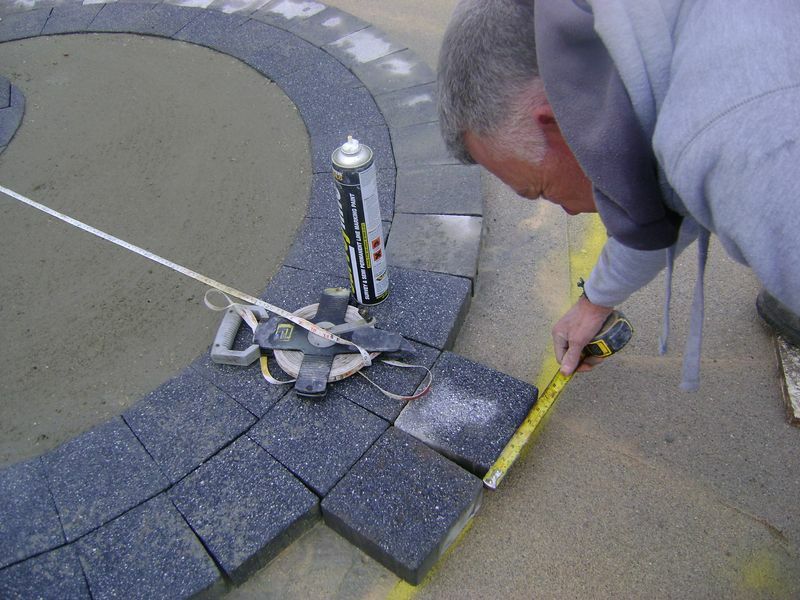 The entire completed render works has an application of Dulux masonry paint, Night Jewels 1, a heavy coat is first applied and once the patio paving cuts are complete and second thinner coat is painted over. 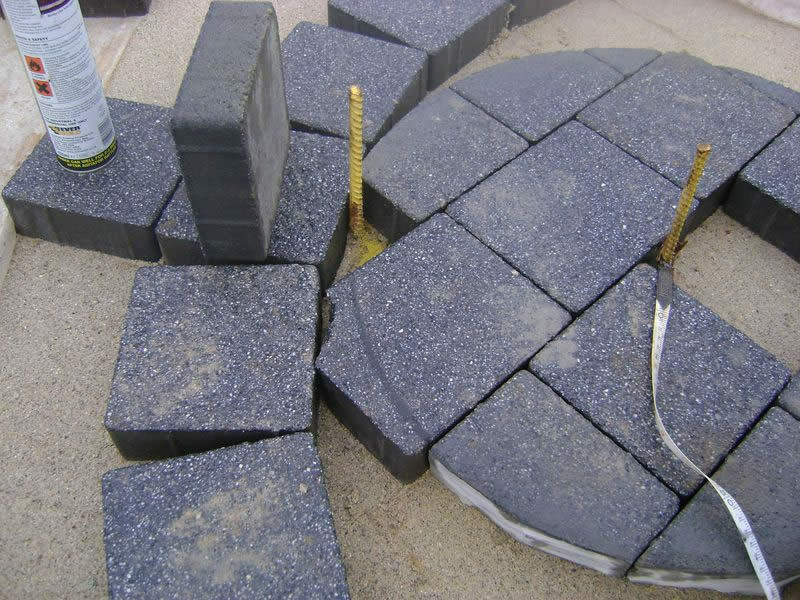 The block paving patio paving bespoke rings are cut and installed to the exact measurement of the pins. 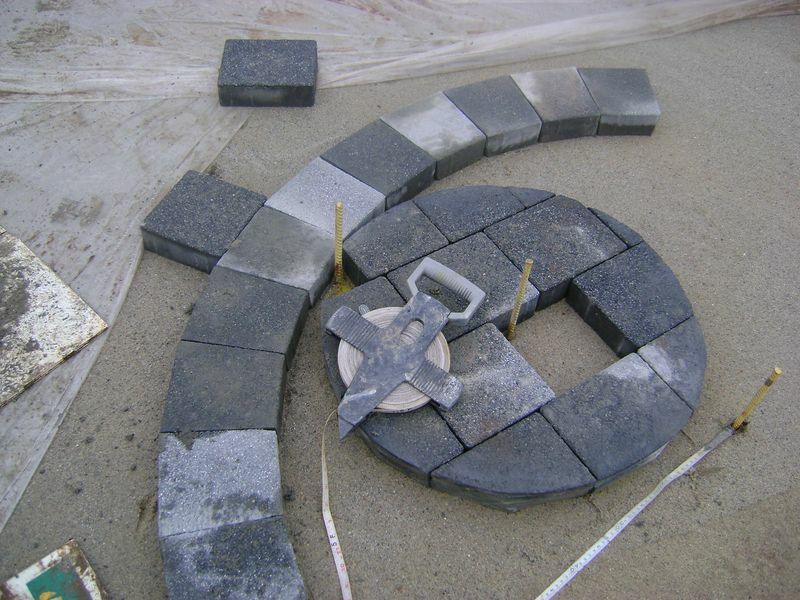 To find out the correct measurement for each cut per circular ring, install two or three full blocks, measure the gaps of the full units and divide by two, in this case the gap was 20mm, therefore 10mm to 0mm is cut off each unit. The hired Clipper was used for two cuts, yes two cuts !! 2 minutes per cut and the lactic acid in the arm burnt….. I know two cuts….. this was returned to the hire company with a unit, a new blade was put on just in case the existing diamond blade had glazed… they too struggled to cut the block. Back to the reliable way of disc cutter then. 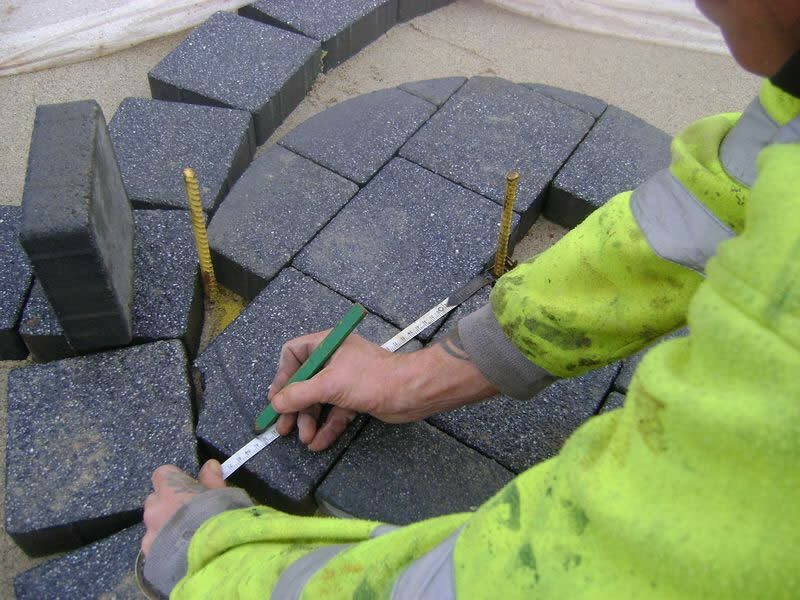 With full PPE cut the blocks as per your calculations per ring, always cut on the angle to prevent large spacing’s. 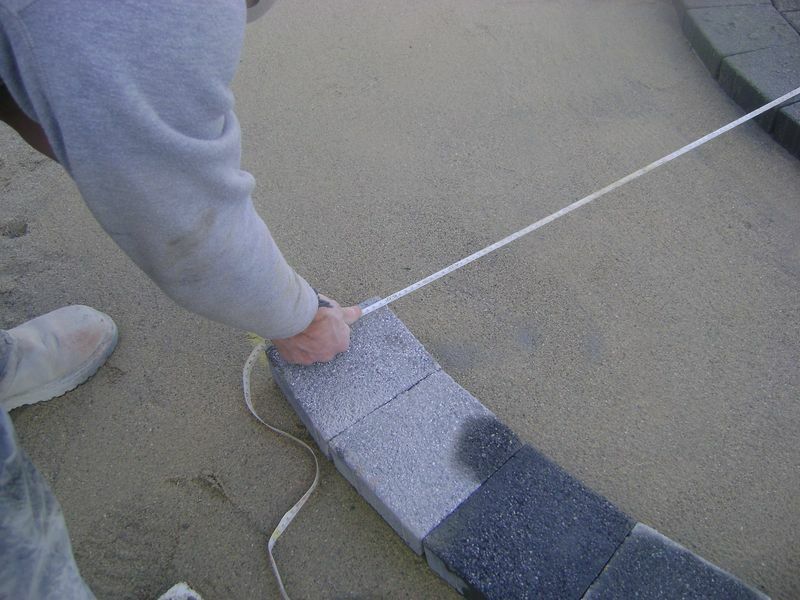 Once the unit has been cut, install on the sand and use the 30mm tape pulled taught from the pin, in this case the measurement is 1550mm and this measurement is used for each and every block. 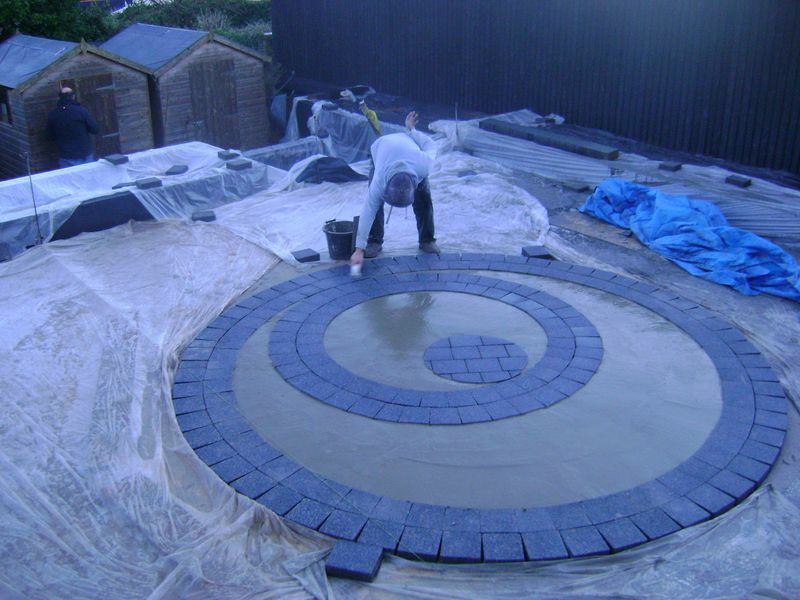 The inner circle of the patio paving blacks are now concreted in place, this will be the base for the 40mm Grono artificial grass, bore holes will be drilled once the concrete has gone off and filled with 3mm gravel for drainage. 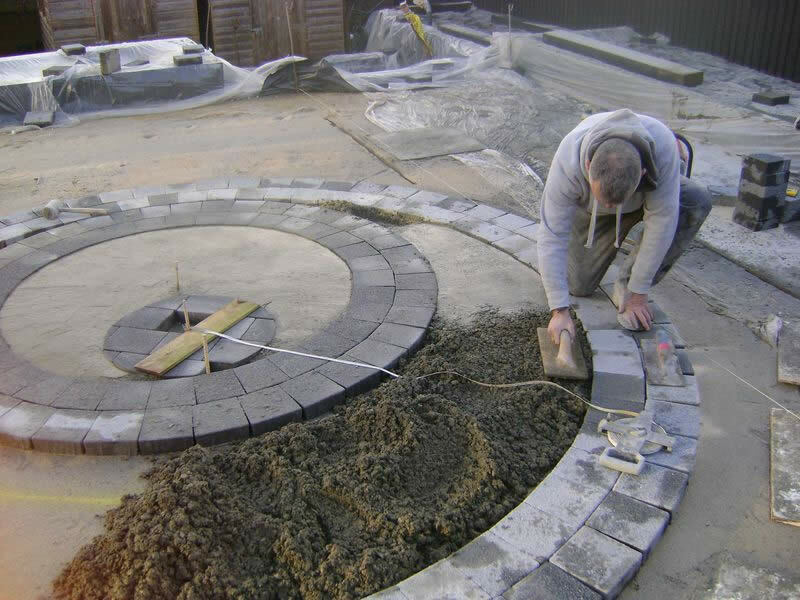 The two offset outer block paving rings are now cut and installed, each paving block is 60mm thick so the depth of concrete I will use is 57mm, this will allow for a seamless transition over the blocks and show the artificial grass to stand higher than the paving. 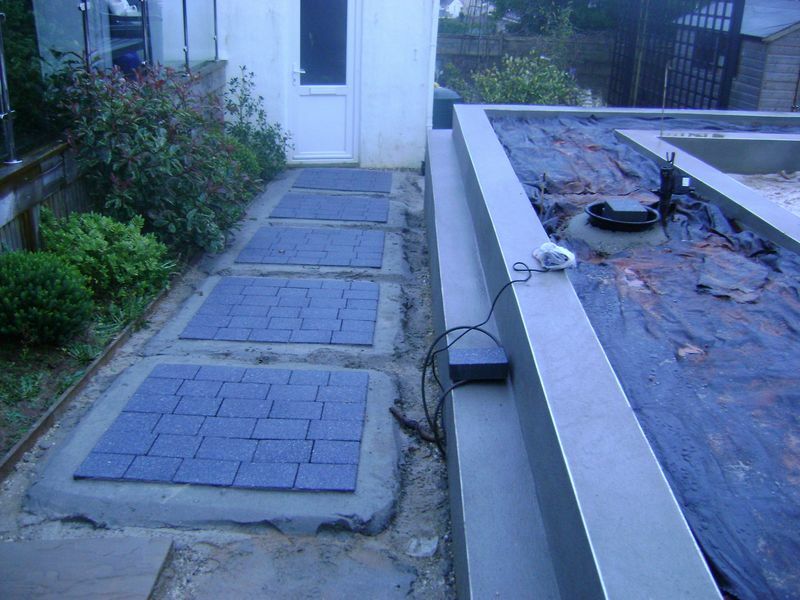 A plastic float is used to form the concrete to the desired levels and falls, the concrete must be wet in order to form a seal over the top. 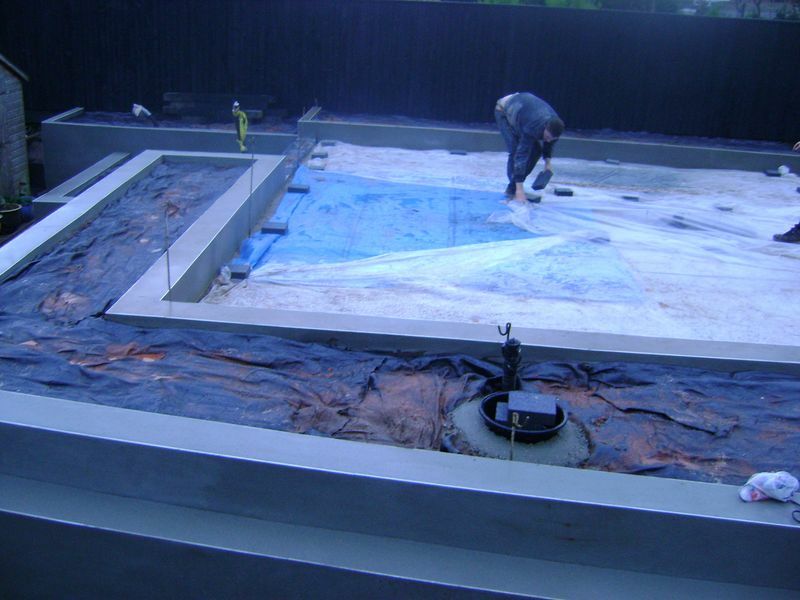 Once the concrete has been leveled with a plastic float, a steel trowel is used to create a smooth top surface as the artificial turf adhesive will adhere to a steel trowel surface as opposed to the rougher plastic float finish. 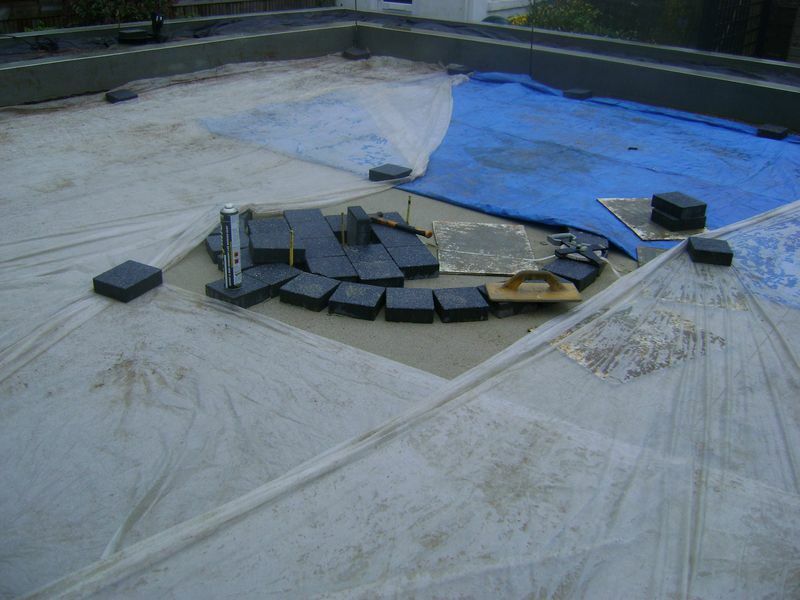 Wash all the concrete from the paving rings, cover and weigh the polythene down.